Tablets stole the spotlight from laptops when they first burst onto the scene, but ultrabooks and hybrids have helped turn the tide in recent years. Cheap laptops are also a popular alternative, and there are plenty of options on the table if you’re looking for the best laptop under $500. When you’re shopping in the budget range, there are some things you just won’t get when dipping down below $500. Want a UHD display or 16GB of RAM? You won’t find a laptop with those specifications in this class, but you may be surprised by how many affordable 15.6-inch machines are available. Before we get to the areas, you should consider, take a few minutes and think about your needs. If you’re a student, you’ll want a laptop with great battery life and reliable connectivity while gamers will want to go straight for the PC with the most RAM and largest processor. While you may think you’re stuck choosing between machines with large bezels at this range, you’d be mistaken. There are actually two styles you can choose from although both have their drawbacks. The Classic Laptop – Any laptop we refer to as a “classic” has a normal form factor with a clamshell design. While the shell can be made from aluminum, you generally have to deal with a lot of plastic. Hybrids – A hybrid laptop is any machine that’s considered a 2-in-1 or convertible. These PCs have hinges which allow you to use the computer in “tablet” mode or set it up like a tent. Typically, these hybrids range from 11 to 13-inches in size and some even allow you to detach the display entirely. RAM is arguably the most important factor when choosing a budget-friendly laptop, but only if the machine isn’t easy to upgrade. Thankfully, modern technology allows us to upgrade RAM on certain laptops which makes a huge difference when you can quickly go from to 16GB without breaking the bank. In other cases, you’re stuck with what you get out of the box. Every PC on our list has a minimum of 4GB of RAM, but you’ll be hard pressed to find a laptop with more than 8GB for under $500. If you plan to run high-end programs, be sure to check out the system requirements beforehand or you may be in for a rude surprise. Speed or horsepower is where things get tricky with budget laptops as you won’t find any running a Core-i7 and only a handful will have an i5 processor. AMD chips and Core-i3 chips are the most popular options. While on the lower end of the power spectrum, most will still provide enough pop to handle applications as long as you have enough RAM. The generation of the chip makes a huge difference as well, so go for the newest model if given the option. As for storage, thankfully things are quite simple with cheap laptops. Solid-state drives have come down in price so if you need speed, opt for a PC with an SSD. You won’t get as much space but can expand through the usual means. HDD’s will provide you with more storage initially but are considerably slower than their solid-state counterparts. When it comes to laptops in the budget-friendly range, ASUS is a brand that tends to pop up. Our first choice from the company is the F510UA from their VivoBook lineup, and it’s ideal if you want an affordable yet powerful machine. While it’s hard to find a good 15.6-inch FHD display at this price point, it’s far from the only highlight with the F510UA. It has an Intel Core i5-8250U under the hood which is backed by 8GB of RAM. The storage capacity comes courtesy of a 1TB HDD. We also love the fact this laptop has a USB 3.1 port and a fingerprint scanner for additional security. This is one of the few Windows-based machines with features typically reserved for pricier PCs. 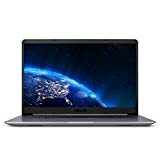 If you like what the ASUS VivoBook brings to the table, but prefer more physical storage, a variant with an extra 128GB SSD is available as well. Equipped with an AMD A6-9200 accelerated processor (2.0GHz, turbo up to 2.8GHz), the Dell Inspiron 15 3000 is the perfect device you want for various projects and activities! The 15.6” LED-backlit display is capable of providing viewers with standard 1366 x 768 HD resolution, while the 8 GB of DDR4 SDRAM and 1 TB storage space are enough for running movies, videos, and advanced projects that require some power. Moreover, the laptop is great for video conferences due to the 720p webcam mounted on the bezel that surrounds the screen and the headphone/microphone combo jack that allows you to use a handsfree set for calls. Finally, the laptop is equipped with the necessary ports for increased connectivity: 802.11b/g/n WiFi, Bluetooth 4.0, 1 x HDMI, 2 x USB 3.0, 1 x USB 2.0, and multi-format SD media card reader. A lot of oddballs appear when you break the $500 range, and Acer has been responsible for plenty of them. That’s not to say they aren’t without a certain amount of charm however like the Acer Aspire E5 which sports a newer Intel chip. Looking for an affordable machine with long battery life? 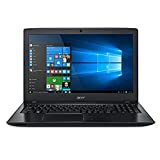 The Acer Aspire holds up better than others in that department although you may not hit the 13.5-hours the company claims. That depends on your usage, but the 8th gen Core i3-8130U certainly helps in that regard. This laptop also has 6GB of dual channel RAM, a 1TB HDD, and an 8x DVD drive. The LED display clocks in at 15.6-inches with a resolution of 1,920 x 1,080. The Aspire E5-576-392H runs Windows 10 Home and has a USB Type-C port to go along with MU-MIMO wireless tech. It’s one of the better options if you’re looking for the best gaming laptop under $500 as well given the fact you can swap out the hard drive and add more RAM. Our first convertible laptop is the ASUS C302-DHM4, otherwise known as the Chromebook Flip. It’s an excellent choice for students of consumer that aren’t concerned about power, and we think you’ll be thrilled with several other features as well. This machine walks a fine line between netbook and laptop as it’s quite small with a 12.5-inch FHD display. That panel has a 360-degree hinge and is of the touchscreen variety. You can use it as a tablet or in tent mode with ease. While the processor is the lowly Core m3, the boots speeds are snappy thanks to 64GB of flash storage and the Chrome OS. The ASUS Chromebook Flip is light at only 2.65 lbs. and you can get “around” 10 hours of juice depending on your usage. It’s not quite 13-inches, but there should be more than enough glass on the panel to satisfy most consumers. With a 2-in-1 design, the Lenovo Chromebook C330 can be a tablet or a laptop, depending on your needs. Moreover, the 360° hinge is perfect for using the laptop in locations where you don’t have access to a desk or a table, as it offers a wide range of positions. The MediaTek MT8173C processor combines nicely with the 4 GB LPDDR3 RAM and 64 GB eMMC storage memory. 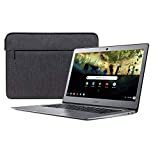 Moreover, the combination is ideal for Chrome OS, a system that offers access to a plethora of mobile apps and other easy-to-use software. C330 is ideal for people who like to carry their work wherever they go since it’s less than one inch thin, weighs 2.6 lbs, and the 11-inch FHD IPS Touch Display is perfect for day-to-day computing. Even more, the device is equipped with all the necessary ports for connectivity: 1xUSB-C, 1xSD and 1xUSB 3.0. Equipped with a built-in pen, two cameras, and a complete Google experience, the Chromebook designed by Samsung is perfect for tackling those final touches on the go. Whether you want to remain in touch with the members of your team while you’re traveling for business or you’re looking for the perfect device to support your school efforts, this 2-in-1 laptop is a great choice. At just under 3 pounds, the device folds into three main positions (laptop, tablet, or sketchbook). Moreover, the Samsung Chromebook Plus features a powerful battery, an Intel Core m3 processor, 4GB RAM memory and 64GB of built-in storage memory. The built-in pen is amazing for various fine-tuning activities from sketching to drawing and more. Also, the 12.2″ FHD (1920 x 1200) screen delivers a vivid visual experience. Finally, the device can be used for video conferences (with the front camera) or for snapping those great pictures (using the 13MP rear camera). The best laptop under 500 may not handle the most advanced programs, but it is amazing for casual projects, Internet browsing, and entertainment! As such, the HP Pavilion X360 15 features a gorgeous design with island-style backlit keyboard, numeric keypad, and HP digital pen included. All these combine perfectly with the 15.6” FHD IPS BrightView micro-edge WLED-backlit touchscreen (1920 x 1080 resolution) that support vivid and accurate colors. 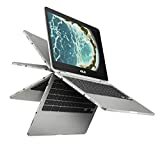 The 2-in-1 laptop is powered by a well-designed configuration featuring 8th Generation Intel Dual-Core i3-8130U base clock 2.2GHz processor (turbo to 3.4GHz), 4 GB DDR4-2400 SDRAM, 16GB Intel Optane memory, and 1 TB mechanical hard drive. Finally, the device supports both WiFi and Bluetooth 4.2 connections, so you won’t ever have to go offline! Not to mention, the sound quality is impressive for such a small laptop! The Chromebook 14 from Acer is a piece of jewelry in both design and configuration! Starting with the design, users love the metallic-silver aluminum case that gives the laptop a stylish look but also protects it from any accidental bumps. Even more, the ultra-thin frame and the fact that it comes with its own carrying case make it highly portable and easy to slip in any bag or backpack. Configuration wise, this Chromebook packs a Celeron N3160 processor, 4GB LPDDR3 RAM, and 16GB eMMC SSD. While the storage space may look a bit slim, you also get 100GB of Google Drive space which helps balance things out. The 14″ Full HD IPS display features a resolution of 1920 x 1080 pixels, which is great for lots of activities such as browsing, working or even watching a movie or YouTube videos. Not to mention, the powerful battery will hold up for about 12 hours, which is quite impressive for a laptop this size! Whether you’re a student looking for a device that does more than a tablet or you’re a professional who travels a lot, the Surface Go can help you out. With a stellar configuration for a device its size, the Surface Go is a beautiful tablet with impressive features that put it amongst the most well-performing machines under $500! As such, under the gorgeous chassis and high-res 10” PixelSense Display you’ll find a powerful processor paired with 4GB of RAM memory and 128 GB storage memory. This allows the device to react fast to your actions be it browsing, viewing documents or media files, playing games, or using the pen to draw or sketch. The cool thing is that the tablet can be used in combination with other stylish accessories such as the keyboard, mouse, and Pen (sold separately). 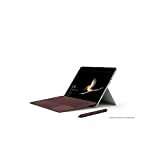 The Surface Go is also considered to be the lightest in the series, at just 1.15 lbs. and it packs a powerful battery that will hold for up to 9 hours. The tablet is equipped with a multi-tasking USB-C port, fast charging Surface connect and supports both WiFi and Bluetooth 4.1 connectivity. Finally, users will have the chance to use Windows 10 in S mode right out of the box, with features such as Microsoft-verified security, Windows Defender, and parental controls.